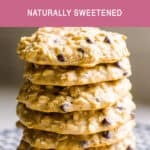 I created this easy protein cookies recipe back in 2012. 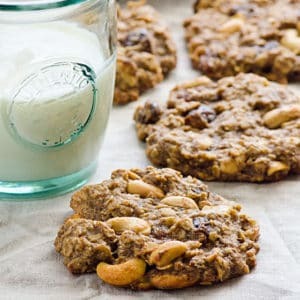 They are high in protein, contain no flour and make great before or after workout cookies aka snack. 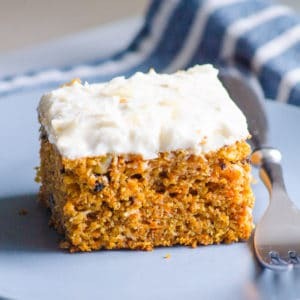 And a great late night couch snack without the guilt. 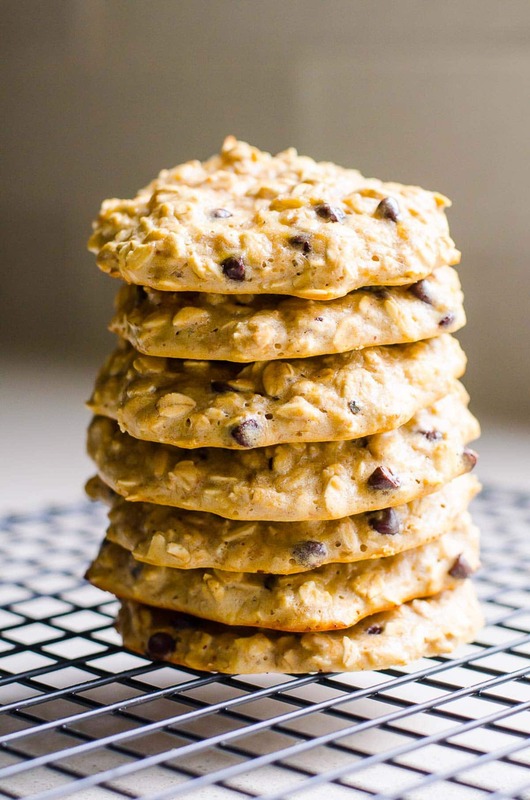 If you ended up on this recipe in the evening looking for a healthy treat, know you probably have all ingredients on hand to make the best protein cookies in the world! I promise store bought protein bars don’t come even close. Especially in nutrition. How Do Protein Cookies Taste? Even kids love these homemade protein cookies. 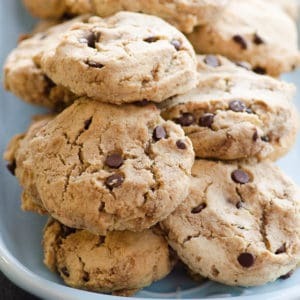 What Are Protein Cookies Ingredients? 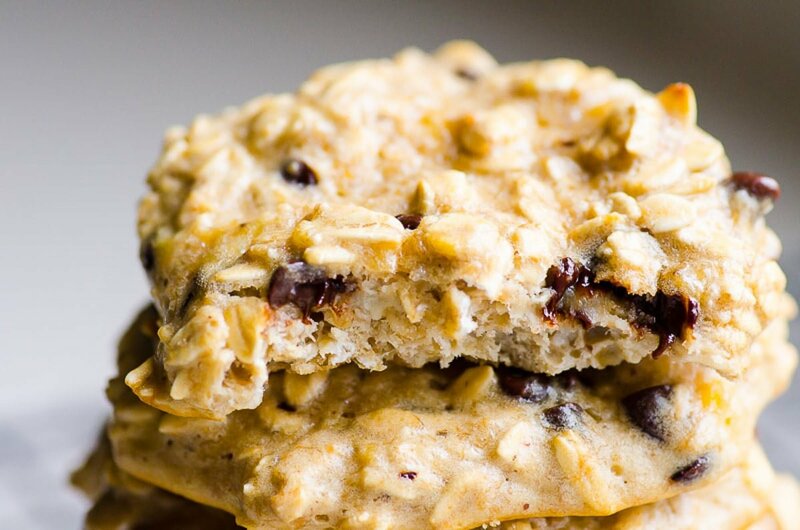 How Many Grams of Protein Is in a Cookie? Recipe makes 12 small cookies or 12 large cookies. Each cookie contains 6 grams of protein. As well as 11 grams of carbs and 4 grams of sugar. Compared to a regular cookie, these are high protein and low sugar cookies. Just think about it! Preheat oven to 350 degrees. Line cookie sheet with unbleached parchment paper or silicone baking mat. Spray with cooking spray. What type of bananas are the best? 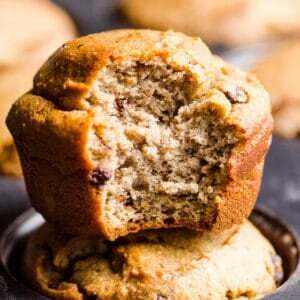 Riper the bananas, the sweeter protein cookies. Very ripe bananas – yellow with brown spots. 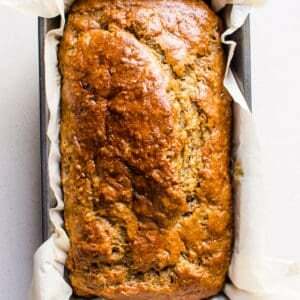 Going bad bananas – brown. Can I use previously frozen bananas? Yes. Every time I see banana gone bad, I stick it in the freezer. It gets even more ugly and brown in there. Thaw it and use. 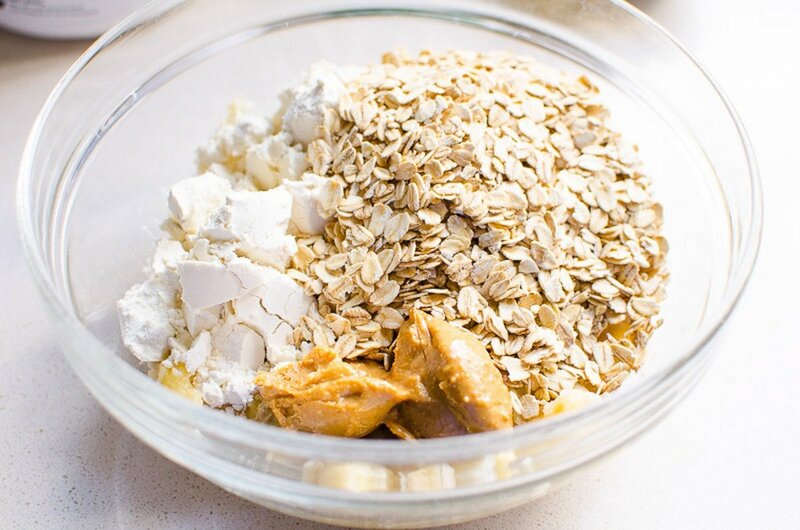 Add whey protein powder, oats and peanut butter. 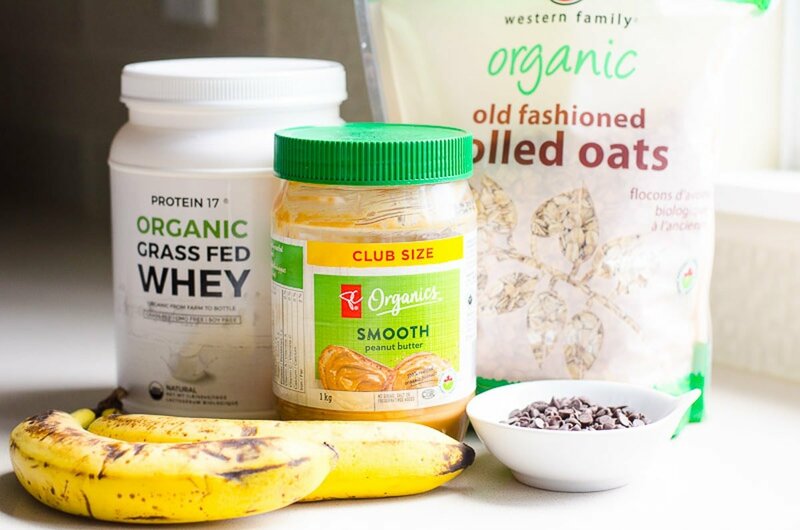 What whey protein powder to use? I recommend whey with minimum ingredients, at least grass-fed, preferably organic. In reality, any whey protein powder will work. End taste will vary slightly depending on protein’s ingredients. I used unflavored whey. 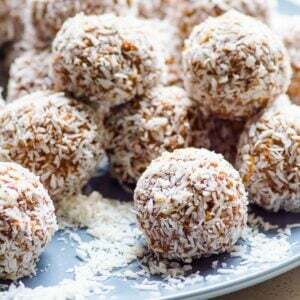 Can I use plant based protein powder? No. Whey protein powder is made from cow’s milk and almost melts with other ingredients. It makes protein powder cookie dough runny. Plant-based protein powder is made from peas, brown rice and other plants that absorb liquids like crazy. Please do not substitute as cookies will not work. What oatmeal is the best? 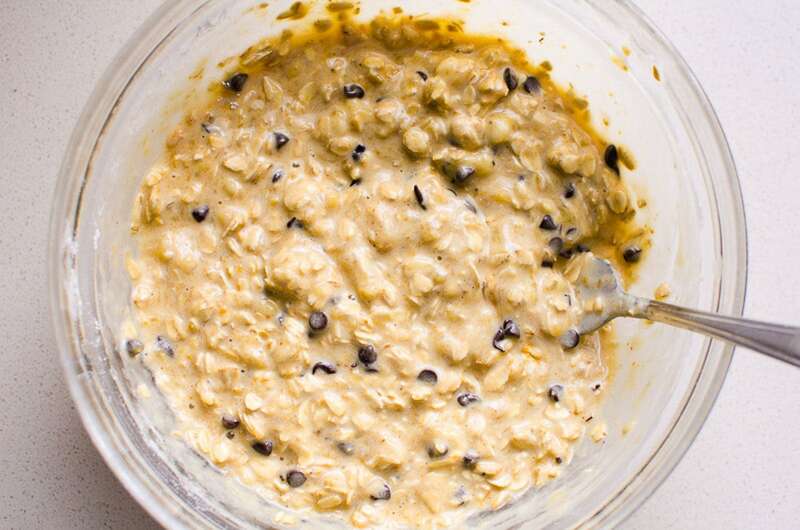 You can use quick oats, rolled oats, old fashioned rolled oats. Please do not use steel cut oats. What peanut butter to use? I always buy organic unsalted peanut butter. It is cheap. No hydrogenated oils. Unfortunately peanuts are heavily sprayed with pesticides. You can use any for this time but please buy good for you peanut butter next time. I recommend organic or at least natural peanut butter without additives. Ingredients should be peanuts and maximum a bit of salt. Stir well with a fork to combine. Dough consistency should be runny. Riper the bananas, more liquidy the batter. Add chocolate chips and give a few more stirs. Spoon mixture onto prepared baking sheet. Cookies don’t spread, so shape them now. Bake for 12 minutes if you have 12 small cookies. Bake for 14 minutes if you got 10 large cookies. Cool on a cooling rack for 5 minutes. Can I Freeze Protein Cookies? Absolutely. If I have going bad bananas I use them all. 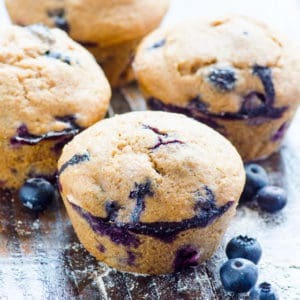 I make these cookies or healthy banana muffins or healthy banana bread. Nothing goes to waste in this house. Freeze cookies for up to 3 months in an airtight container. 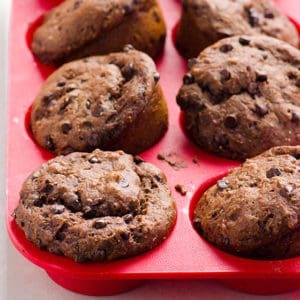 Chocolate protein cookies – very similar in texture but all the chocolate! 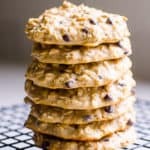 No bake protein cookies – perfect for summer plant-based peanut butter cookies. Craving cookies? 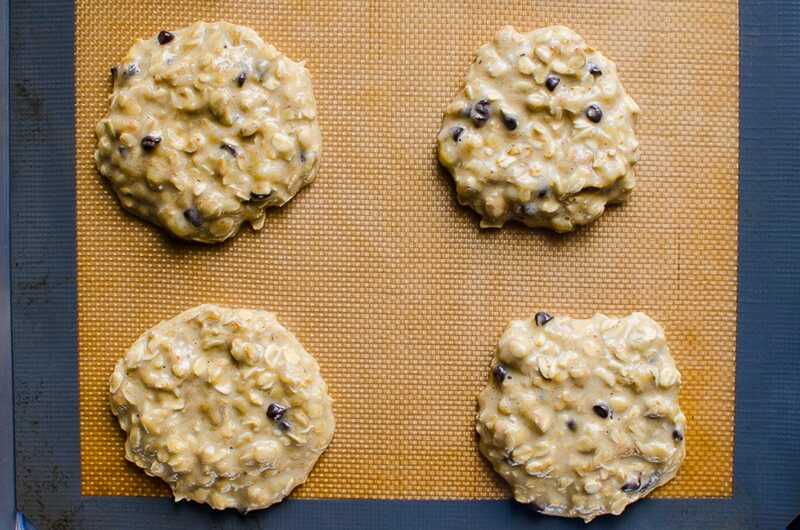 This tasty protein cookies recipe is so easy, you can make it right now. Hurry up! Preheat oven to 350 degrees. Line large baking sheet with unbleached parchment paper or silicone baking mat, and spray with cooking spray. In a medium bowl, mash bananas with a fork. Add whey protein powder, oats and peanut butter; stir well to combine (batter’s consistency will be runny). Add chocolate chips and give a few more stirs. Spoon mixture onto prepared baking sheet (cookies don’t spread, so shape them now) and bake for 12-14 minutes (depending on size). Cool on a cooling rack for 5 minutes. Freeze: For up to 1 month. The best way to defrost protein cookies is in a microwave. That way the moisture and softness is restored. *You can use vanilla whey, just make sure you buy unsweetened one.